Bank of Ireland officials told the finance committee that they would veto any suggestion of debt write-down made by a Personal Insolvency Practitioner. BANK OF IRELAND’S Chief Executive Richie Boucher has defended his €843,000 salary, saying it is voted on by shareholders annually. 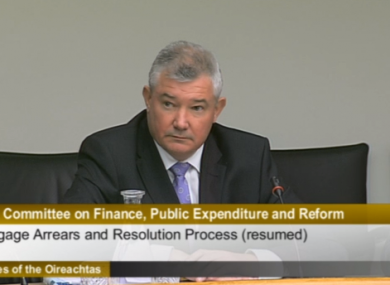 Boucher told the Oireachtas Finance Committee this morning that his salary is “clearly and transparently set out”. He noted that the Irish State’s 14 per cent share in Bank of Ireland is currently worth in excess of €1 billion. Boucher said: “2013 was a year of very significant progress for the group” where it exited the government’s Eligible Liabilities Guarantee Scheme, addressed deficits in its pension scheme and invested in IT. He stressed that the €4.7 billion bailout from the State was not “given” to the bank. “We weren’t given money – it was invested and we are required to pay it back. He noted that the bank is in a “very strong franchise position” in Ireland and receives about 1,000 mortgage applications and 1,000 creidt applications from SMEs every week. Boucher added that the bank was “now comfortable and producing capital” and has repaid €1.8 billion to the taxpayer to date. He said that no discussions on when the bank will become a privately-owned entity have been held with the government. He told the committee that BOI granted almost four out of every ten mortgages, worth €2.2 billion, and half of property lending to SMEs in 2013. When questioned by Sinn Féin Spokesperson Pearse Doherty on the issue of debt write-down, Stephen Mason, Director of BOI’s mortgage arrears resolution strategy, admitted that the bank would veto any Personal Insolvency Practitioner suggestions of debt write-down. Boucher had earlier told Senator Thomas Bryne: “The practice and the policy [of the bank] is no debt write-down”, except in the case of bankruptcy or insolvency. The lender is currently dealing with about 30 active bankruptcies. Doherty asked the bank if Finance Minister Michael Noonan had contacted the bank to tell them that threats of legal proceedings “should not be used to reach the marked targets” in terms of restructuring loans, as he indicated he would. Boucher and Mason both said they were “not aware” of any such correspondence. “Our own targets are to restructure mortgages, which we are achieving,” Boucher said. Mason said that payments on nine out of ten of their private dwelling house loans and eight out of ten of their buy-to-let loans were up to date. Mason added that one in ten of its PDH loans were in arrears of more than 90 days. He stated that 86 per cent of customers who had been offered loan restructuring were meeting payments, while the industry average for this was was 77 per cent. Some 800 BOI customers, including 80 in default, have been offered split mortgages. Just one mortgage-to-rent deal has been completed by the bank, with a further 80 in process – of which Mason said six are close to completion. The bank has to date sent court letters regarding entering legal process to more than 3,000 of its borrowers and more than 600 have engaged with their voluntary surrender initiative. Boucher is the latest bank CEO to face the committee this week – his counterparts from AIB, Permanent TSB and Ulster Bank were questioned over the past few days. Email “Richie Boucher defends €843,000 pay, says BOI is 'comfortable'”. Feedback on “Richie Boucher defends €843,000 pay, says BOI is 'comfortable'”.